London Underground: Transport for the privileged? Next time you’re on the Tube take a look around you. If you think that it’s increasingly full of white, business class professionals, it’s because it is. According to newly-analysed data from Transport for London, slipping down the underground escalator means taking a step up the social ladder. The data paints a stark picture of a growing social divide in our city. While richer groups speed to work underground, poorer and more diverse ethnic groups are forced to take the bus. Public transport by name is increasingly exclusive by nature. The latest figures show that almost four in five of London’s Tube users are now managerial and professional workers, and the situation is getting worse. In 2003, Londoners in the bottom half of the income spectrum made up 28 per cent of Tube users, but in the latest data from 2009, this dropped to 22 per cent. It is hard not to link these divides to a difference in fares (theÂ cash priceÂ for a Zone 1 single fare is now Â£4). This week I’ve been talking to cleaners and caterers who cannot afford to use the Tube in the city they call home. Instead they flock to the bus, which remains expensive and problematic. Take Elena, a cleaner from Columbia who works for Â£6.08 an hour. She holds down two part time jobs. Without access to the Tube or train, she has to leave her North London home at 5am. Together with hoards of other workers on the minimum wage, she gets a chain of buses before dawn breaks. Her need to travel between jobs means that she spends almost five hours a day travelling for six hours work. At present Elena pays Â£68.40 for her monthly bus pass. If she were to buy a full travelcard with Tube access, it would cost Â£106, approximately one fifth of her monthly wage after tax. The mayor doesn’t seem to get the problem. Since Boris Johnson was elected, the cost of a weekly zone 1-4 travelcard has increased by 23 per cent, and he remains committed to 20 years of above inflation fare increases. Migrant workers like Elena are particularly likely to be affected. According to TfL’s figures, some 39 per cent of bus users are from black and ethnic minority communities compared to 29 percent of Tube users. Bus dependency also continues to cause massive problems for families. Alberto, another cleaner, says his daughter has to leave the house at 5am with his wife. She waits at her mum’s work reading until school opens, and she always arrives tired. Meanwhile Alberto makes his anxious journey across London. If he misses one of his busses or falls asleep, he risks being fired. There are economic consequences too. Transport is the circulatory system of our economy, but workers like Elena have been known to turn down jobs because they are too expensive to get to. It also makes it difficult to make English classes, and itÂ hits women hardest. 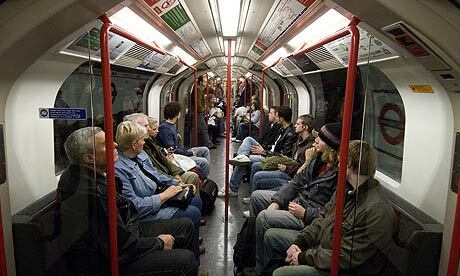 According to the figures — unavailable online but released by TfL to theÂ New StatesmanÂ — some 78 per cent of Tube users are now from managerial and professional groups, defined asÂ ABC1s. In contrast, just 22 per cent of Tube users come fromÂ C2DEÂ groups associated with the bottom half of the income spectrum. This compares to 37 per cent of bus users who are from this category. When the Greater London Assembly estimates that roughly half of London’s population is in each group, something is clearly out of synch. Although this decline in diversity was visible when Ken Livingstone was mayor, he’s developing policies to buck the trend. If he is elected next year, he says he’d cut fares by 5 per cent in 2012 and freeze them until 2013. As for Boris Johnson, we don’t know what the consequences would be if he won another term in office. Under his watch, TfL have suspended the Underground Users Survey until further notice. If such a move saves costs, it also buries bad news.